A HAMPSHIRE property manager who is a dab hand at baking chocolate orange cakes for charity is to sponsor a junior snooker tournament next season. Retired RAF test pilot David Stewart is keen to help the south’s high-flying young potters enjoy the sweet taste of success. His company, Odiham-based Vortex Property Management, will back the first legs of the Cuestars South of England Under-21 Gold, Silver and Bronze Tours at Waterlooville Sports Bar in September. Stewart, a member of Chandlers Ford Snooker Club, said: “I’ve seen a phenomenal increase in the standard of our under-21s over the last four or five years. “It’s a great game. It broadens you not just in terms of playing snooker but it teaches you how to cope with losing and it teaches you self-control. It’s a thinking game as well as a physical game. 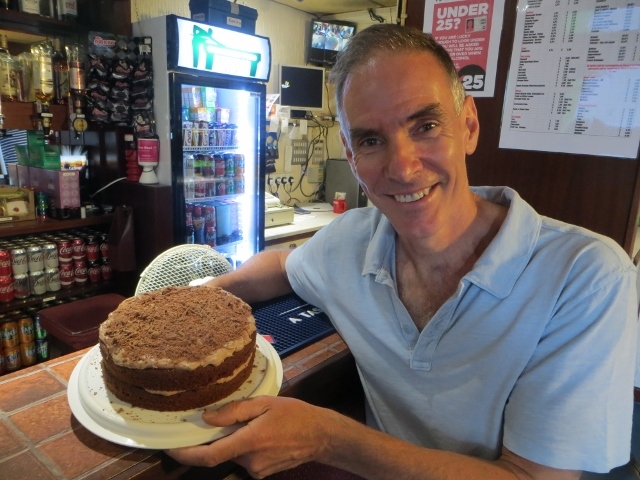 Stewart also raises money for Sightsavers, an international charity that works in developing countries to treat and prevent avoidable blindness, by asking for donations for the cakes he bakes. “It’s a great charity, based in this country, and the Queen is the patron,” he said. “I’ve supported it for many years. Stewart, whose highest break of 55 in competition is the same as his age, started playing snooker as a teenager on a half-sized table before packing his cue away for 30 years when work took over. As well as taking part in events at Chandlers Ford SC, he competes on the Cuestars Seniors (40+) Tour and he won last season’s Cuestars Masters (55+) title by a whisker.